Two thousand people are being resettled in their villages in Sri Lanka's north-west after being displaced by the civil war, which ended in May. The group is the third and largest batch resettled so far as part of an ongoing programme in Sri Lanka's north. Although they are returning to their original home areas in the Mannar district, some of their homes would be rebuilt, officials told the BBC. More than 250,000 people are still being kept in government-run camps. The 2,120 Tamils and Muslims being resettled represent another step towards what the government calls a "northern spring", a return to normality in the large portion of the country which was affected by the war. A resettlement ministry official told the BBC that the government was helping provide items like fishing nets and boats, irrigation tanks and gardening goods. 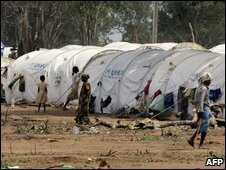 The UN refugee agency is monitoring the return process and assisting with water and sanitation. It says these people fled their homes about two-and-a-half years ago, just after the start of the final phase of the war which saw the armed forces go all-out against Tamil Tiger rebels fighting for a separate homeland. Landmines have had to be cleared before these returns. The government says the people living in the huge camps in the neighbouring Vavuniya district are being strictly vetted to ensure they have no links with the rebels. Only after that process can their return home be considered. It was not immediately possible to find out from officials whether the latest batch of returnees have been vetted in this way. Even though the war has officially ended, Sri Lanka remains a heavily militarised country and the authorities say the military will play a vital role in resettling those now in the Vavuniya camps. "The military will be with the civilians even after the last refugee is resettled in his or her village," the official in overall charge of resettlement, Major-General GA Chandrasiri, said on Sunday.